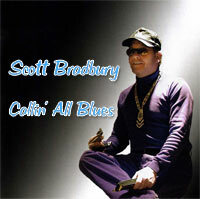 Scott Bradbury & the Bad Boys " Callin' All Blues"
Scott would like to give a special thanks to: Jimmy Rogers , Dorothy andJimmy Lane, the Lane family, Jr. Wells, Floyd Jones, John Brim and Grace Brim, Eddie Taylor, Sam Lay, Paul Butterfield, Andrew "Blueblood" McMahon, Charlie Musselwhite, Alices Revisited & Crew. The Badboy Blues Band: Tim Bradbury, Pete Crawford, Dave Clark, Steve Freund, Dean Haas, Twist Turner, Mark Brumbach, Jerry Wilson, Mojo Charles, & Danny "DoubleD" Draher. The Crew at The Smoke Daddy. The Fabulous Fishheads: Mark Hannon, Bob Levis, Harlan Terson, John Hader, Kenny Smith. Bob Ott, Frank Nava, Dave "Measel" Mee. From the old neighborhood: B.A.B., Jeff Allen, Wayne Borucki, Sterling & Mike Powell. This CD is dedicated to my late father Fabian "Brad" Bradbury. TearDrop Records would like to thank: Manny Sanchez, thanks for the great vibe Manny. Tre', Marty Binder and Scotty B. You guys rock! Tom Luttrell at Audioimpac, J.B. Ritchie and Bobby Humes you're on the front line every night. Special thanks to all the folks at MSM, especially Jeffrey Terchin, Mike Taylor, Larry Allen AKA L.A., Mark Sobieski, Blake Emerson and Sam Savage. Always thanks to Lisa, Leslie and Alainya Bandy and the entire Altekruse family.